Let’s be perfectly honest … it is way too easy to speak about the current Luis Suarez situation at Liverpool Football Club with a bunch of useless platitudes about ‘cultural differences’ and ‘language barriers’ – something which has been done to death by media-types. So I will try to analyze the situation from a different angle than most of the punditry. To be fair though (regarding culture and language), I was quite ready to give Suarez the benefit of the doubt in the language problems associated with his alleged racial comment to Patrice Evra; it seemed extremely plausible to me that South American Spanish slang would not be readily translatable or understandable to a Frenchman (or the Englishmen who sat in judgment on Suarez for the FA). And therefore, out of consistency, it makes sense that something could have been lost in translation or ‘culture’ when Suarez went down to the Confederations Cup a couple of weeks ago and began the drama of edging for a move away from the “dreariness of England” and the petulant, repugnant media that prowls the EPL. If you were to ask me up until now what I thought of Suarez and his stint at LFC, I would have been effusive in my praise of his skill and what he brings to the team, however I would have lamented how he hasn’t been given a fair shake by the media or the FA, and I would have been defensive of his … well … loco-ness. I wouldn’t go so far as to say that every bit of trouble he’s been in is a harsh response by people who don’t understand him – that’s silliness. But I probably would argue that most of the bile and barbs directed at him are from people who really do not want to see him do well, nor do they want to see him in any way but as a villain. Villainy, after all, is a very odd happenstance. When you think about all of the people who are in your life – at home, work, school, church, or the stores or restaurants you frequent – how many would you describe as “a villain?” It seems to fall to storybook characters or historical and famous people to be “villainous.” But the character of the villain seems to be a necessary ingredient for understanding life; as if our eight year-old selves can’t grasp a world where there isn’t a Joker to every Batman, a Wet Bandit to every Kevin McAllister, and a Gargomel to every Smurf. All of this means that we may simply manufacture villains for ourselves out of the opponents we face, or the objectionable people that just rub us the wrong way. And it is in that context that Suarez is perfect for non-LFC supporters! Furthermore, when you factor in that there is a lot of latent hostility to LFC from opposing fans – both in and out of the media – it makes sense that Suarez would be branded a villain simply because he’s so good. Which is also why LFC fans (like myself admittedly) have been so ready to overlook or minimize some of his issues. I have never seen anyone in football that can accelerate as quickly as he can over his first two steps. He has an uncanny knack for being able to dribble into three defenders and pop out of the other side with the ball bouncing in front of him and bewildered looks on the faces he left behind. He simply must be the most prolific “nutmeg-er” (kicking the ball between the defenders legs) that has ever played the game. And he has one of the softest outside-of-the-boot shots in the biz. Throw in a bit of never-say-die, give-everything-for-ninety, body-placed-on-the-line, sell-outishness and you’ve got a villain that turns to hero very quickly for the mesmerized Kopites that watch the telly every week. That’s what he’s become for Reds fans: a hero. He’s a guy who seems to pop up with important goals … not necessarily by being silky smooth all of the time (he’s not Messi), nor by delivering a slaloming run through seven defenders (he’s not Neymar), nor even by some pent up, exhibitionist physicality (he’s not Cristiano). He delivers because he works hard – an attribute that is simultaneously heralded as eminently Scouse and a throw-back virtue of the great Liverpool teams of Shankly, Paisley, Fagan and Dalglish. All of this heroism and adopted Scouse-ness makes it so much harder for LFC fans to be calm about Suarez’ comments in the media about wanting to move on. They have defended Suarez against unfair (yes, unfair) and unjust (yes, unjust) accusations by an unreliable and ill-tempered Frenchman captain of the evil empire that is Manchester United (See? I can have villains too). They have made allowances for his craziness on the pitch. They have adopted him as a son of the city, a guardian of the crest and a neighbor (probably along the lines of the crackpot one who keeps every newspaper over the years in order to have something to line the cages of his parakeets – but a neighbor nonetheless). For him now to speak out about wanting to leave, when on International duty at the Confederations Cup no less, is therefore a slap on the faces (or bite on the forearms, in this case) of those who have defended and accepted him. It sours the relationship and frays the knots that have been tied between him and the club. As a fan, it’s too easy to dwell on this situation and get mad and hurt … which is silly since he’s only one player on a squad of ~25. It is also easy to get mad, hurt or apprehensive because it seems to be a further indication that LFC is not considered a top club by the best players in the world anymore. 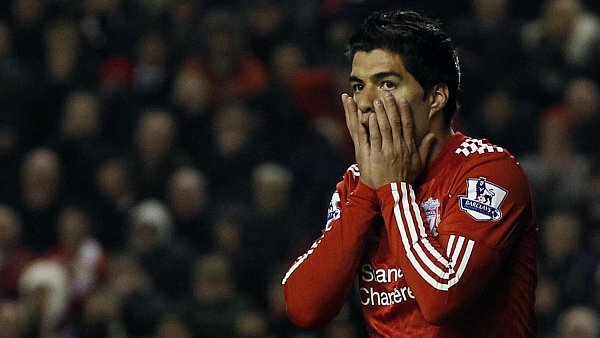 But when examined for what it is, it is more of an indictment into a key Suarez character flaw – that of disloyalty – to which us Reds fans had insulated ourselves somewhat. Disloyalty always itches and burns like a splinter under the skin and it can fester if allowed to stay. Therefore my hope is that he is either cut out from the squad (only at a nice, tidy profit for reinvestment purposes though) or that the club is given a dose of immunization to his less charming qualities. Either way, the time when Suarez was viewed as a hero is over and finally we Kopites are seeing some (though certainly not all) of the things which have branded him the perfect villain for the rest of the league. Loyalty is beautiful and sacred, while no sword cuts as deep as that which belongs to a friend.